One of the most requested features we’ve had since we first launched Sellwire is to have the ability to email all of your customers when you add a new version of your product. Now you can! When uploading a new version you can now tick a checkbox that will automatically email all of your previous customers letting them know of the update. After months of hard work we’re proud to announce the new Sellwire! This massive update see’s a completely new design across the whole site and app, loads of new features and the absence of a “beta” tag. It’s been a tough slog but we got there and are very happy with the results. But don’t worry, we won’t be holding back now that the new site is out. We’ve got loads of awesome stuff still in the pipeline for the future. But before any of that, here is a run down of the changes we’re launching today. For the last month or so we’ve employed the amazing Scottish designer James McDonald to completely rework the Sellwire design (the app and the site). Everything will be getting a new lick of paint in the coming weeks, and we wanted to give you sneek peak on what we’ve been working on. So keep your eyes peeled for our big update by following us on Twitter and subscribing to the RSS feed. Added “Version” and “Total Sold” columns to the Files page so you can see how your files are performing at a quick glance. Added the ability to Export Orders (button at the bottom of the Orders page) in CSV format. Many other small bug fixes and tweaks. We’re continuing to build Sellwire and work towards getting it out of “beta” status. As always please let us know if you have any feedback. Today we launched a big update to Sellwire which we hope you will love. 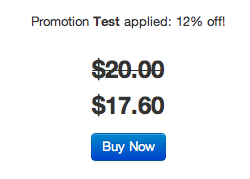 Now you can create Promotions for your products in a dynamic and powerful way. Simply navigate to the new “Promotions” section of the Sellwire app to get started.